To say that the weather has been a little miserable over the past week here in the Greater Kruger Park would be a little bit of an understatement. The clouds swallowed up the sun’s warmth whenever it tried to give a helping hand. The cold front has brought temperatures right down to single figures, but worst of all was the blustery wind. In general, the animals view the wind about as favourably as I do, and for good reason. Not only is the wind cold, but it also hides the approach of predators. Prey species are always noticeably more skittish in such conditions, and most retreat to the thick bush to get out of the wind and remain hidden from view. 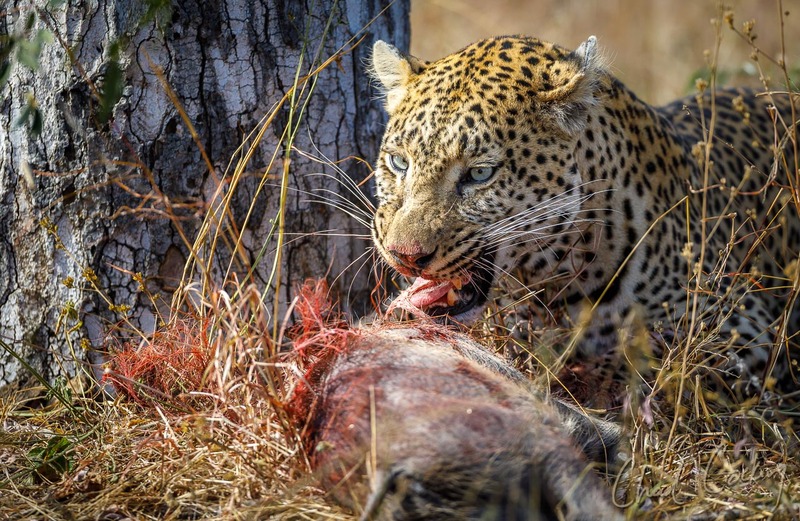 On the contrary, these conditions are usually relished by the leopards of the Timbavati, as hunting becomes that much easier. When the guests awoke at our tented safari camp on 15 July to strong winds, they had to pry themselves out of bed. No one was really keen to head out there in cold, windy weather. 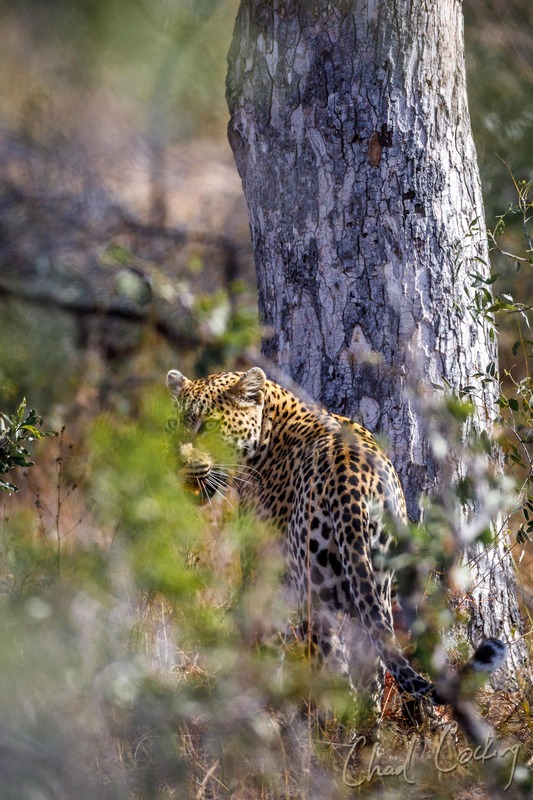 However, I was hopeful that the winds would have at least worked in the favour of our leopards, and it didn’t take long to see that indeed it had. Thumbela female and her two youngsters were found with an impala kill on our eastern boundary, and out in the west, Sunset female was also discovered enjoying a young male impala. One leopard that was not having as good a time of it was the dominant Madzinyo male leopard. We found him walking around the eastern parts of the concession clearly on a mission to find something – anything – to stalk, but he was just not having any luck. We left him to it, thinking that with conditions as they were, it wouldn’t be long before he got himself a much needed meal. The following day after another cold and windy morning, I was heading back for bush breakfast when a radio call came in that a male leopard was found resting on a termite mound not too far from Tanda Tula Safari Camp. As my guests were big cat fans, I opted to head in that direction before going to breakfast. We joined the sighting and found that it was once again the Madzinyo male. He had evidently not had any luck in finding a meal, but with the windy conditions persisting, this hungry leopard wasn’t giving up. 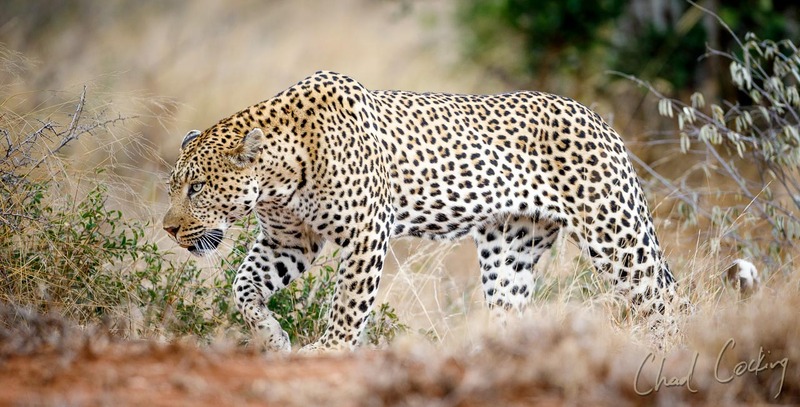 Whilst following the leopard, we could see that he was heading for a termite mound. Leopards often use such vantage points to scout for a meal, so we drove around to the other side and waited for him to approach, which he did a minute or so later. It was only then that I recalled his speciality of spying on warthog burrows in these sorts of mounds. With the large gaping hole on this particular one it appeared to be an ideal warthog burrow. As soon as the leopard approached the mound, he went straight to investigate the hole and his reaction was immediate. He had no sooner put his nose into the hole when he retreated. It was the first time I have ever seen a leopard tiptoe backwards, but he knew that in that hole was a potential meal. He was hungry. He was experienced. He was patient. Once safely away from the hole, Madzinyo went and sat behind a bush, poised and ready. I explained to my guests what was happening and decided not to move for fear of disturbing the scene, so we just sat tight. From past experiences with such situations, the leopards’ patience usually outweighs mine and I leave a long time before anything happens. After all, by 10am in the morning I was also starting to get hungry! This time however, things were different. 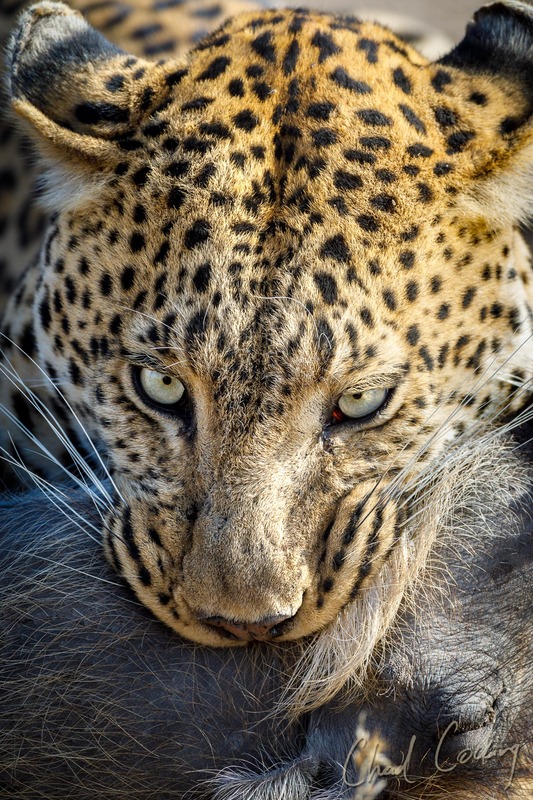 Within a minute of the leopard taking up his ambush position, puffs of dust started blowing out of the hole – the warthogs were inside, and were preparing to come out. Not thirty seconds later an adult female popped her head out. She was a fair size, with a set of tusks that even an experienced leopard like Madzinyo would have to be weary of. He no doubt had his eye on her and was busy calculating the exact moment when to strike, but whether he knew it or not, she was soon followed by a handful of younger piglets. It was then that I knew the action was about to really kick off. 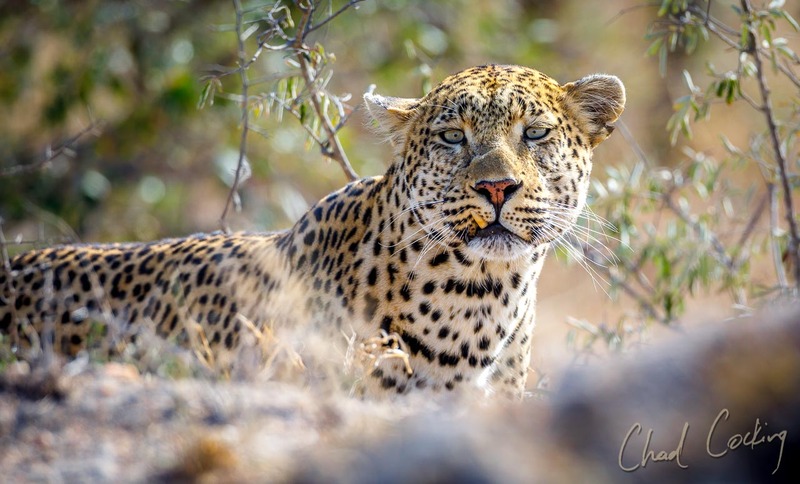 As soon as the leopard saw the first youngster, he launched himself from his perfect ambush position – upwind and in the warthog’s blind spot. He went flying straight for the hole and its occupants, that were no doubt wishing they had stayed inside a little longer. 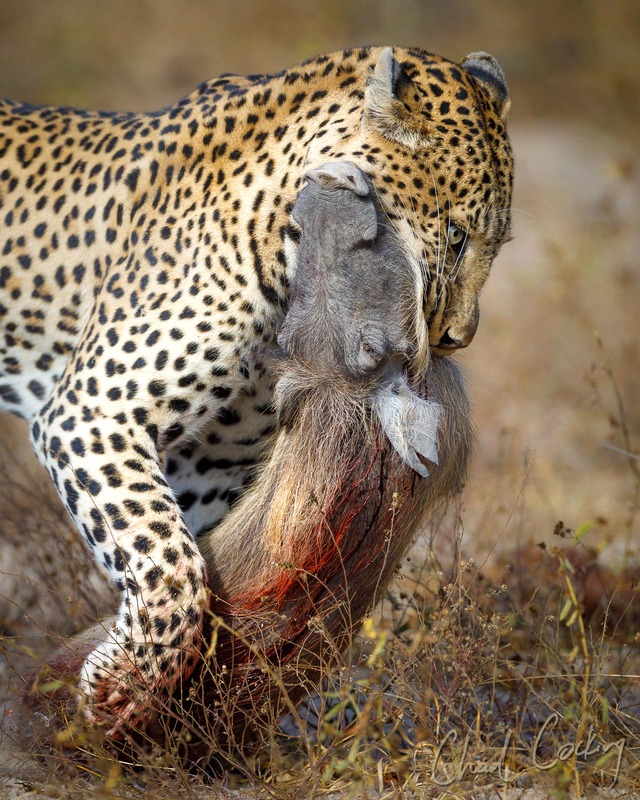 In a flash the leopard was on top of one, and he managed to subdue the young warthog so quickly that it barely had enough time to get a distress call out. My guests speculated that it was possibly because of this that the mother warthog didn’t come running back to assist her unfortunate offspring as they are often known to do. She possibly didn’t even realise that one had been caught. Whatever the case, there was no squealing, and a rescue mission was not forthcoming. The piglet gave a last bout of kicks to try persuade the capturer to release it, but it did nothing to alter the course of the inevitable. Within a couple of minutes the leopard walked off with his breakfast. Scenes like that are not always easy to witness, and not everyone can bare to watch the rawness of nature unfold at such close proximity. My guests and I however, were all in awe of what we had just seen. It certainly was the most spectacular leopard kill I had witnessed in my time. 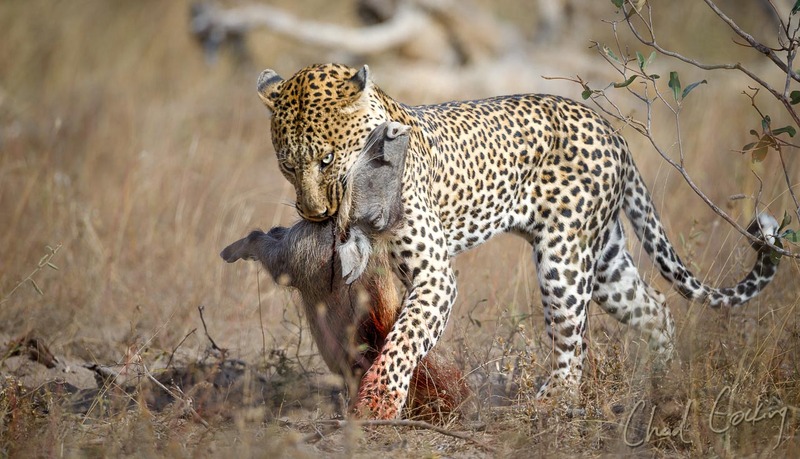 With adrenaline pumping, we followed the leopard as he dragged his kill towards the safety of a marula tree. He was clearly quite indecisive as he walked past two perfect trees before settling below a third one to begin eating. Despite waiting a while longer, it became clear that he was in no hurry to hoist the carcass until later in the evening. We opted to head back to camp for our own breakfast, all still buzzing from the magic moment that we had just experienced!